The ferry line from Dubrovnik to Elaphite Islands connects islands Lopud, Šipan, and Koločep with several daily departures. 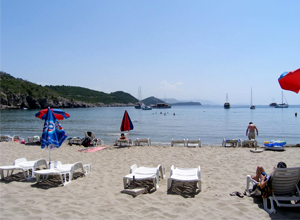 The beach is very popular for swimming and although its considered remote due to its location, it has two restaurants with toilets, deck chairs and parasols, pedal boats and kayaks. Because of its surrounding, not much shade can be found on the beach so don't forget to bring a lot of sunscreen and water with you. The beach is very shallow (on some part you have to walk more than a 100m before you can start swimming) and there is often a fresh breeze because of which you can easily get sunburned. The beach is very clean, with an excellent quality of the sea. When facing the sea, the left part of the beach is FKK reserved. Join locals in the popular game "picigin" - played in shallow water with a small ball. And don't worry... it only looks painful! Šunj is accessible either by sea (with your own boat / private transfer) or by foot from Lopud settlement. Just before the remains of hotel Grand, a street on your left hand side will lead you to the beach trough a beautiful shady forest. Just keep following the signs. Note that there aren't many shops on the island and that they are not open for the whole day. Bring enough food and drinks with you or enough cash to order something at the non-reasonable priced restaurants on the beach.